Amazing Banana Bread – dairy, egg, gluten and oil free!! Ok, so I’ve been attempting to create a vegan, oil-free, gluten-free banana bread for years with little success. I know quite a few people are using almond flour these days (think Paleo. Ugh. Pulease). Most people using it are avoiding grains (again, pulease), and using way too much of the stuff, making the baked goods super fattening. 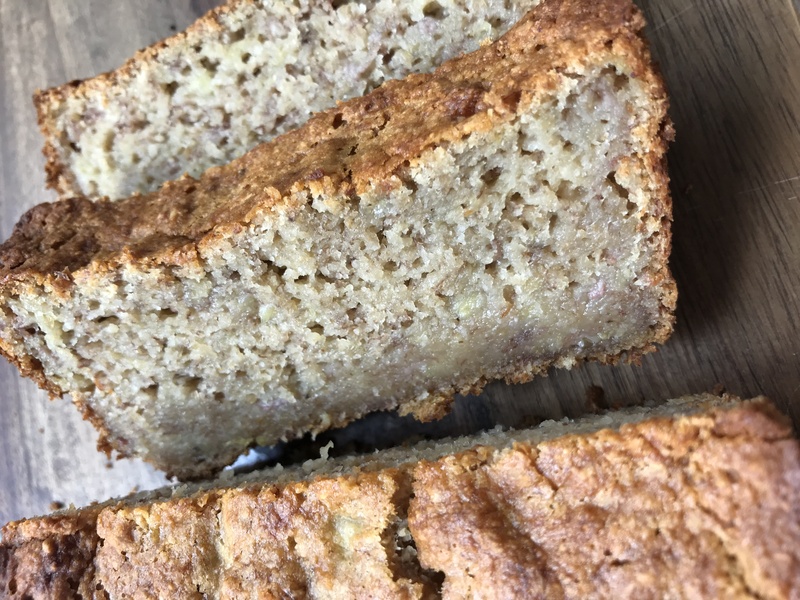 I have created this quick-bread with a combination of flours which helps cut down the fat but still gives it that yummy, dense and moist texture of traditional banana bread. Of course, the other trick to amazing banana bread is overripe bananas. I’ve tested this recipe 5 times and it’s come out great every time using 1 1/2 to 1 2/3 cups of banana, which is the equivalent of about 3-4 bananas. One of the best things about this recipe, other than the texture and flavor, is how quick and easy it is to make. I have the batter ready to go before the oven is even preheated! You can dump all the ingredients in one bowl and mix! Again, this banana bread is vegan, oil-free, gluten-free, egg-free and refined sugar-free, using only 1/3 cup maple syrup to sweeten. It’s not nut-free of course, so if you must avoid almonds I’m so sorry!! I haven’t spent time experimenting with a substitute but I could if there is interest out there. Anyway, I hope you try this and love it as much as we do. Add 1/3 cup chocolate chips for a special treat! I thr ew this together recently for dinner when it was over 100 degrees outside. Didn’t feel like a hot meal, and definitely didn’t feel like turning on the oven or spending a lot of time at the stove. The only cooking required is for the quinoa and that’s super quick, especially if you have a pressure cooker in which it quinoa takes 5 minutes at high pressure. This is a great dish to share at a potluck, picnic, or for this coming weekend, a Labor Day BBQ. It holds up well in the fridge for a few days; the sauce/dressing soaks in quite a bit but the flavor is still there. Delicious on its own or on a bed of lettuce. I threw these together one morning when I knew my green smoothie wasn’t going to be enough. I just needed something to chew and help me feel satiated. These little bundles did the trick. If you’re looking for light, airy and fluffy, run away. They are dense, fiber-filled clusters of lemony, oaty goodness. I love oats, and I adore lemon, especially during warm months, so the combo seemed like a good fit. Just zesting lemons instantly elevates my mood so I especially love dishes that call for lemon. This recipe is super easy and quick to make, and very healthy consisting of healthy, whole foods. These are every bit as good without coconut so if you don’t care for it or can’t have it, feel free to omit. Make sure your bananas are very ripe; if they aren’t you may need to add more than the called-for 1 tablespoon of maple syrup. 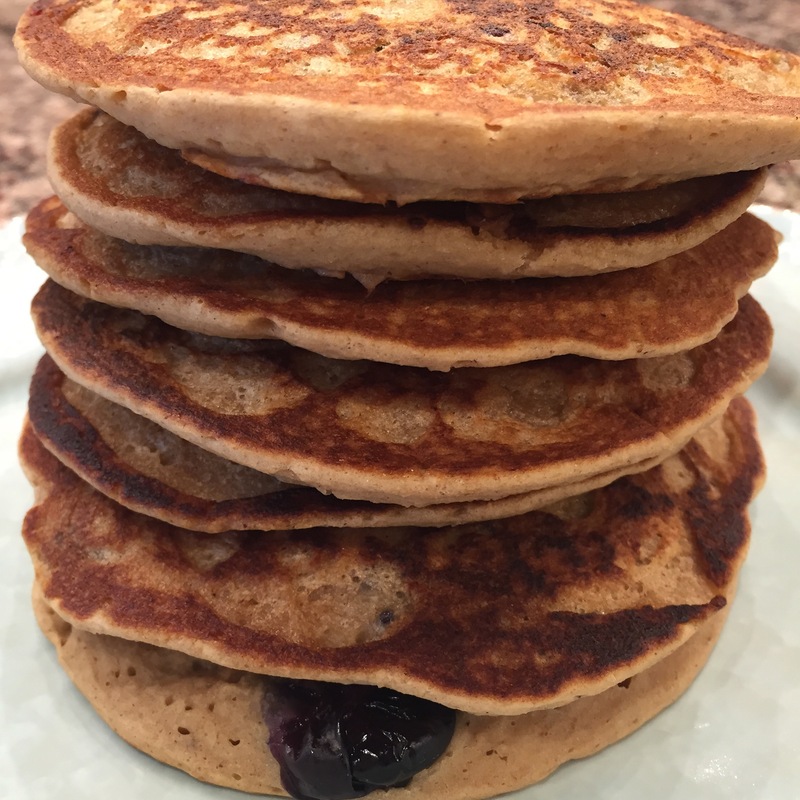 These babies were created when I just threw a bunch of pancake-related items in my Vitamix. I didn’t feel like measuring out the flour and I figured using rolled oats would work, blended along with everything else. And work it did! Yummy. Easy to make, healthy and delicious. Feel free to add chocolate chips, blueberries or chopped/sliced bananas to the batter once it’s poured onto the griddle. People are coo coo for cocoa. Me? I like it. Sure. But I wouldn’t consider selling my offspring for the last bar on earth as some people I know might. It’s good. I enjoy a quality piece of dark chocolate or a chocolatey dessert as much as the next girl, but when I like chocolate best is when it’s paired with something else, for example, peanut butter, raspberry, or in this case PUMPKIN! 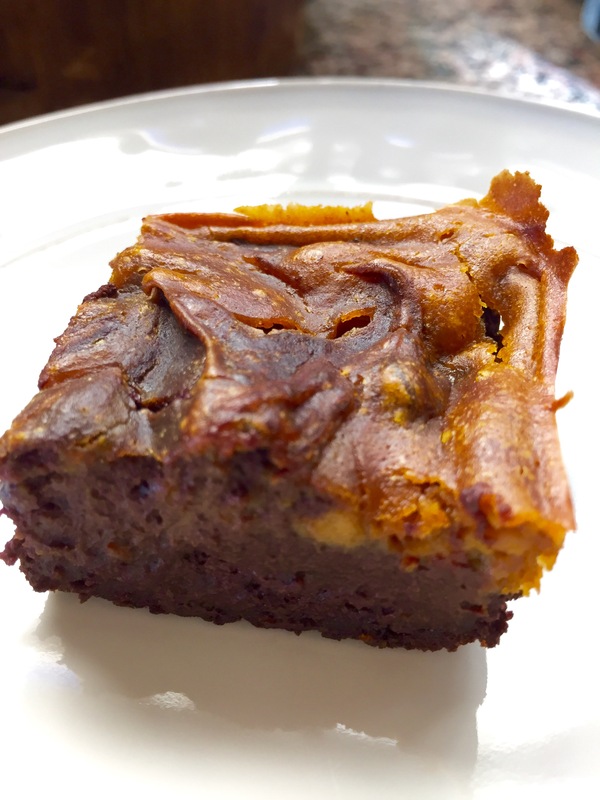 If you’ve never had chocolate and pumpkin together, you’ve been missing out! 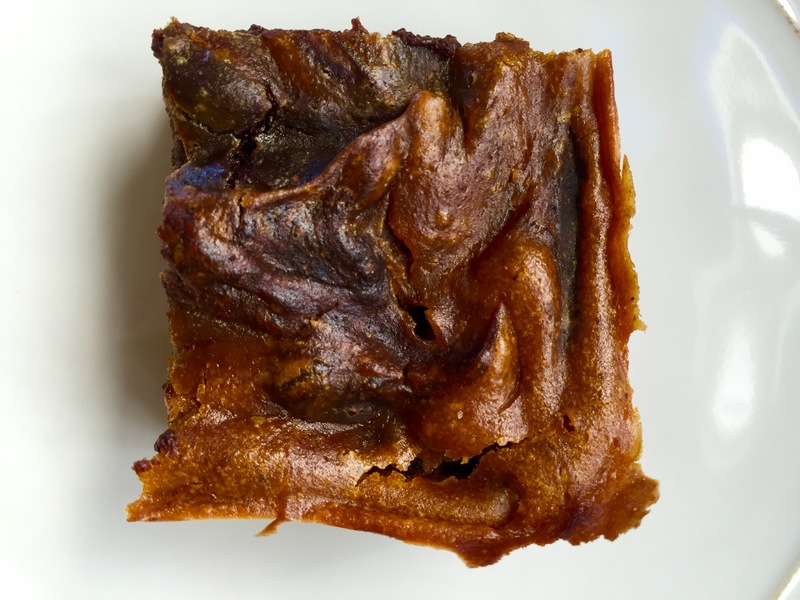 The warm spices we associate with pumpkin taste great with the rich chocolate. This recipe calls for healthy whole foods like black beans and pumpkin, uses very little flour, and no refined sugar or oil, and no eggs or dairy of course. The only not-so-healthy part is the chocolate chips but we only use 1/4 cup. I really like to use the Wonderslim cocoa powder as it’s lower in fat and caffeine than typical cocoa powder. And try not to eat the whole pan. I got a Waring-Pro double waffle maker a few years ago and have only used it twice. I just couldn’t find a waffle recipe to my liking. The first one was a disaster and the second just okay. For my third attempt I scoured the internet and found several vegan recipes but they either contained oil, had bad reviews or weren’t gluten-free. For the record, I don’t believe wheat/gluten is the evil food many people make it out to be but I seem to have a sensitivity so I go without, which is really no big deal. When done right, it really does force one to make healthier choices. Which is why most people feel better and lose weight after cutting it out of their diet; not necessarily because gluten was making them heavy or feel badly but because by cutting it out they eliminated processed foods and crap. But I digress….we are supposed to be talking about tasty waffles here, not gluten. 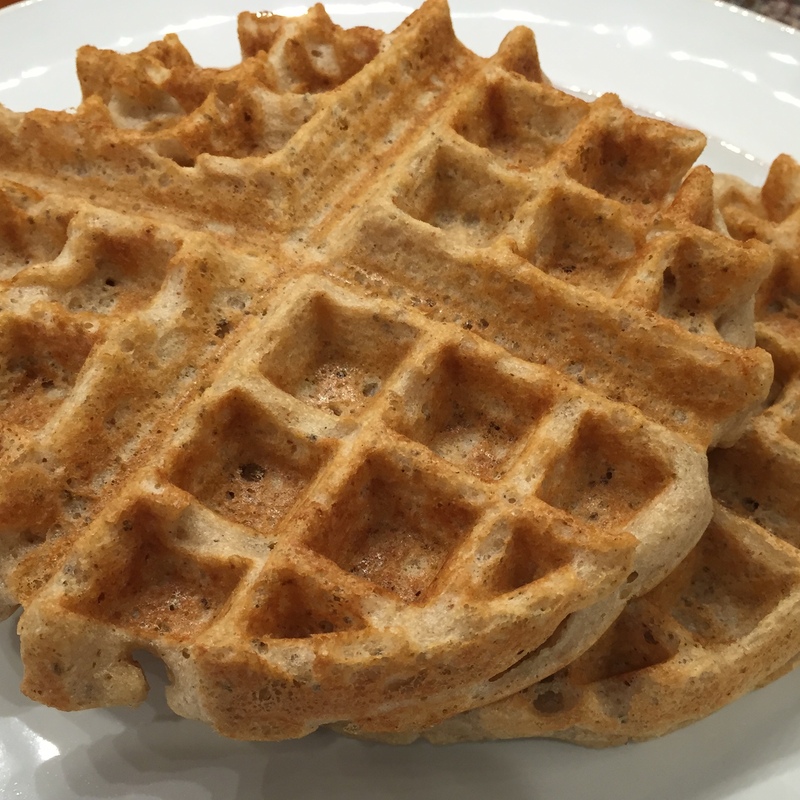 As I was saying, I couldn’t find a good waffle recipe so I took a chance and made one up, and man was I happy I did! These waffles came out crispy on the outside and soft on the inside. I did have to spray the waffle iron with cooking spray – you just can’t get away from that; trust me, I know this from experience. So have at it! I hope these work out as well for you as they did for me. Every day for breakfast I have a smoothie filled with all sorts of nutritional goodness from greens, berries, banana, homemade almond milk and flax seeds. Some days though, I want something different and I will make oatmeal topped with banana, grated apple, cinnamon, a few walnuts, some almond milk and a touch of maple syrup. 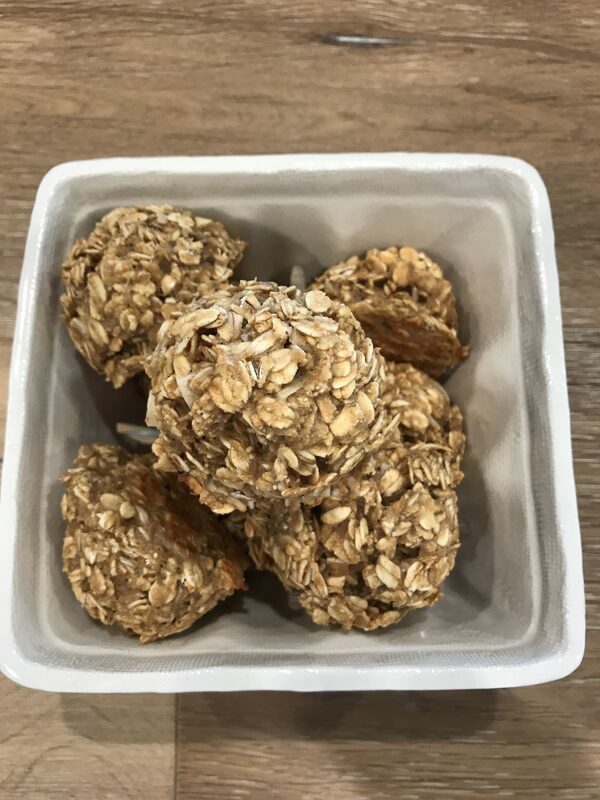 Kinda hard to eat a bowl of oatmeal on the run or if you’re in a hurry though, and impossible to eat out of your hand (not that I’ve tried). So, I set out to make a super healthy muffin that would be like a bowl of oatmeal disguised as a muffin. 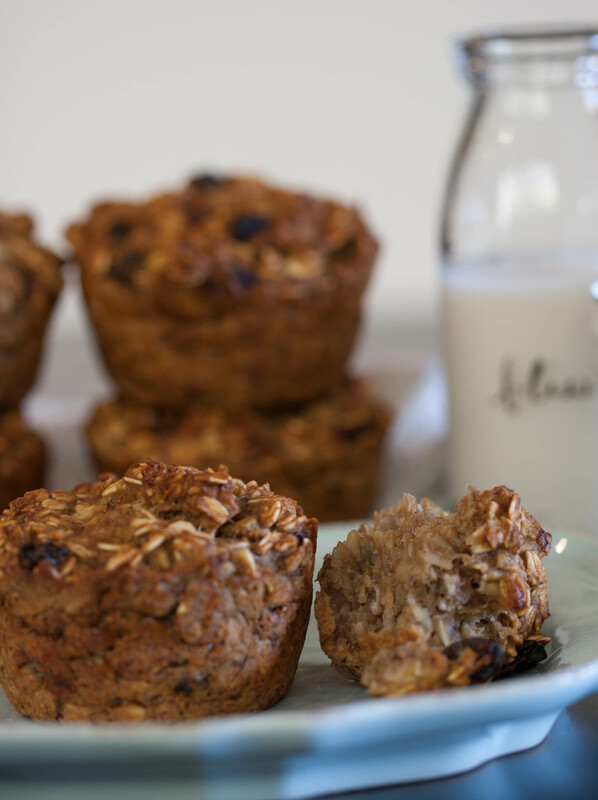 These muffins have the same ingredients as my hearty bowl of oatmeal with delicious toppings. They are dense, hearty and satisfying and best of all – easy to make! * You need a 6-cup muffin tin for this recipe as it makes larger muffins than the 12-muffin pans. You can purchase here:Jumbo Muffin Tin. You could use a regular 12-muffin tin and make smaller muffins – just cook them for less time, 30-35 minutes. * If your bananas are super ripe you can omit the maple syrup as the ripe bananas will add just enough sweetness. 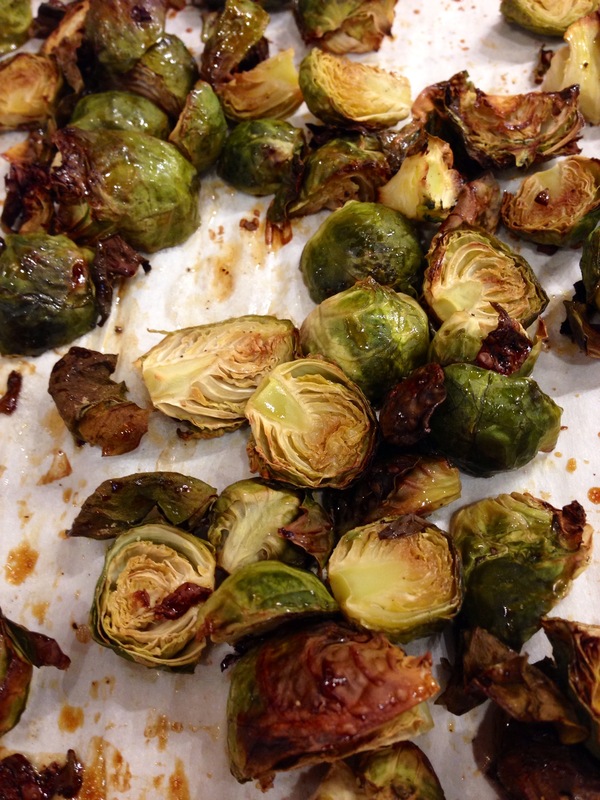 Roasted Brussels sprouts are really popular right now and we eat them a lot in our house. Wanting to change up the flavors just a bit, I decided to add some sweet (maple) and sour (lemon). I think this is my new favorite way to eat them. I made them on the same night I made Spicy Butternut Squash Soup. The soup was a bit too spicy for me and I found myself taking bites of soup and sprouts together to tame some of the heat. Ultimately I dumped my entire plate of sprouts into the soup. I may eat it this way forever. Really good. I know. It’s getting a little ridiculous. Another pumpkin recipe. I can’t help it! I told you I love all things pumpkin. The season is short – I must embrace it! So, I made a pumpkin-spice cake for my sister’s birthday this past week. It was really good. The next day I tweaked the recipe just a bit and made delicious cupcakes. 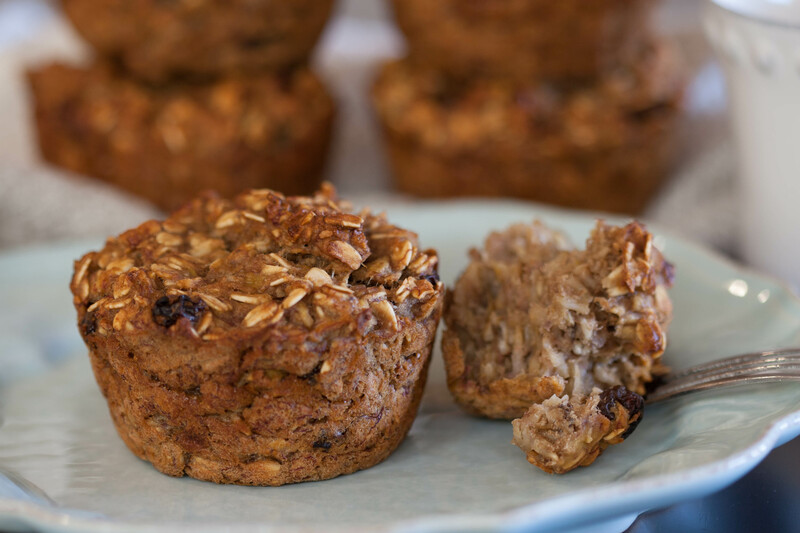 The next day I tweaked it even more, making them gluten-free, and a sharable recipe was born! 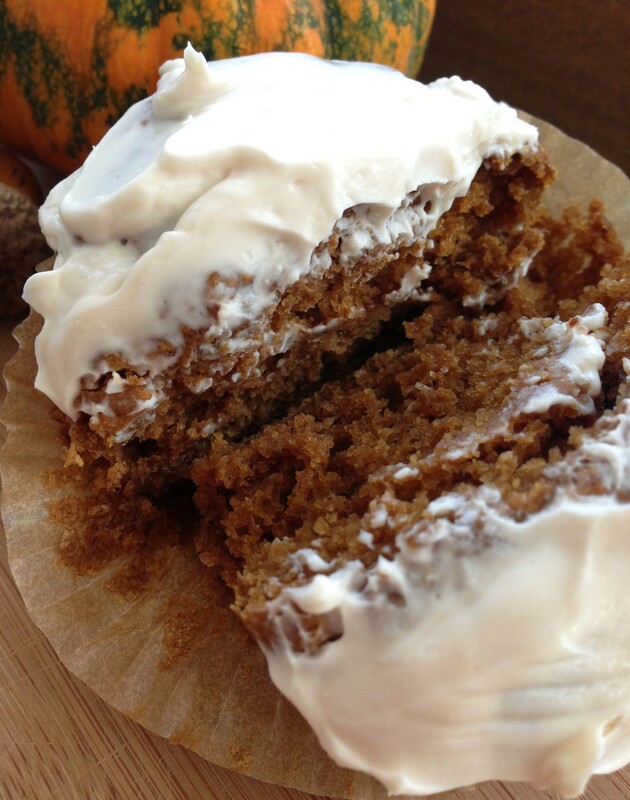 If you don’t care to make these cupcakes gluten-free, whole wheat pastry flour is fine. Also, use 1 TBS pumpkin pie spice if you’d rather not bother measuring out the cinnamon, nutmeg, allspice, ginger and cloves. *Oil-free if left unfrosted. The cupcake itself is oil/fat-free but Tofutti Cream Cheese is made with oil. 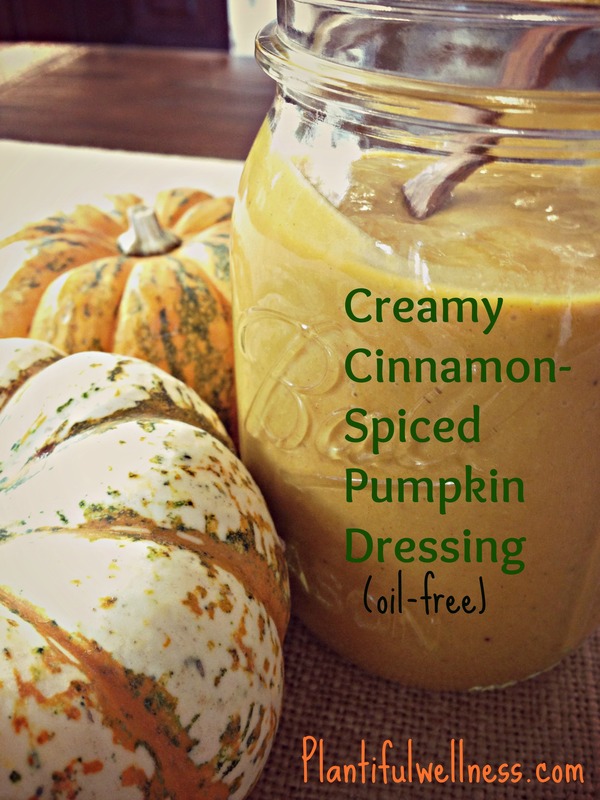 Pumpkin Dressing. Vegan. Oil-free. Low-fat. Gluten-free. As I’ve said before, I’m in love with all things pumpkin. This savory dressing is no exception. Other than my Pumpkin Soup, I’d never made a non-sweet pumpkin dish before. I was very happy with the results. Start small with the cinnamon and work your way up, tasting as you go. And, depending upon how much tang you like, start with 1 TBS lemon juice and go from there. I made this for a salad in which I put pomegranate and toasted pumpkin seeds – delicious! It would also be tasty on greens like kale, or steamed broccoli and cauliflower.